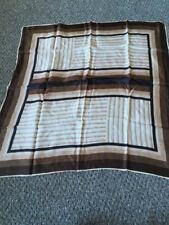 Lanvin Paris Vintage Silk Scarf , 1980s, Geometric Print, Hand Rolled 22.5”, #2. Condition is Used. Dispatched with Royal Mail 1st Class. Please take a look at my other vintage scarves I can combine postage please 2kg for £2.95. I can post anywhere please contact me for a quote. All items packaged in a ziplock bag and a secure mailer. Smoke free house If for any reason you are not satisfied I offer no quibble returns. Please see my feedback. Great condition 31" square Please take a look at my other vintage scarves I can combine postage please 2kg for £2.95. I can post anywhere please contact me for a quote. All items packaged in a ziplock bag and a secure mailer. Smoke free house If for any reason you are not satisfied I offer no quibble returns. Please see my feedback. Condition: Very good, woven fabric all good, original colours all good, i.e. NO fading. See photos for detail. Smart colours tangerine, tangerine, olive, black and pale straw. Vintage Geometric Burnt Orange/Navy/Grey Satin Scarf 14cm Wide x 106cm Long Geometric squares navy/grey and cream on orange background fringed hems This comes from a smoke free home Condition is Used- lovely overall condition bar one tiny mark near edge (See photo) and one faint orange mark (see photo) **Always happy to post abroad using the Global Shipping Programme*** Dispatched with Royal Mail 2nd Class. Jane Shilton Large Silk Square Geometric/Patchwork Type Design. The colours of this scarf are, Browns, grey and coral. The material is 100% silk. Made in Korea. Rolled edge. The scarf measures 83 cms X 86 cms. This scarf has been preloved, not worn much so is in a good wearable condition. Measurements: Length: 67cm Width: 66cm Condition: 9.5/10 Excellent overall condition. CONDI TION NO HOLES NO STAINS, ALL OUR SCARVES ARE CLEAN (UNLESS STATED). CONDITION NO HOLES NO STAINS, ALL OUR SCARVES ARE CLEAN. Some threads loose and a small bit of the edge unstiched Faux Silk feel Hand rolled edges Please take a look at my other vintage scarves I can combine postage please 2kg for £3. I can post anywhere please contact me for a quote. All items packaged in a ziplock bag and a secure mailer. Smoke free house If for any reason you are not satisfied I offer no quibble returns. Please see my feedback. It is a stunning must-have accessory. I cannot see any marks or holes. It is a stunning must-have accessory. I cannot see any marks or holes. The colours and patterns are sharp and distinct. Good condition small scag shown in picture hard to notice. Has not been owned or worn by Amy Winehouse but designed by the legendary singer. I cannot see any holes in the beautiful fabric. Measurements: Length: 30cm Width: 30cm Condition: 9.5/10 Excellent overall condition. I cannot see any holes in the beautiful fabric. DEAD STOCK GEOMETRIC & EGPTIANS HAND ROLLED VTG LARGE SILK SCARF 36"X36"
Hem: Hand rolled. Fabric : Silk. Width - 36". Length - 36". Double thickness with natural ends. Present Gift. Simply request the total at checkout. Liberty of London Geometric Print Silk Scarf 50s 40s vintage pocket square 23"
Unknown age or fabric. good used condition. It has hand rolled edges,Richard Allan signature and embroidered label. Used fabrics may have stitchlines and other marks - however I take lots of pictures and describe any marks and wear. 27" x 27" / 68.5cm x 68.5cm approx. 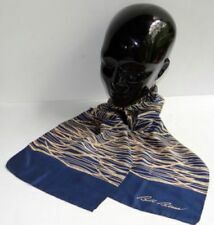 Stunning long SILK SCARF i n PERFECT CONDITION. N avy with swirly spots. Condition: PERFECT. crisp, clean silk. DANIEL LA FORET STRIKING COLOURFUL GEOMETRIC HAND ROLLED SILK SCARF 26" x 26"
Hem: Hand rolled. Fabric : Silk. Width - 26". Length - 26". I cannot see any holes or pulls in the beautiful fabric. This is probably one of the best luxury silk scarves I have ever seen. It is a stunningly bright, multi-coloured, must-have accessory. It is a beautiful green colour with a rose pattern. It is a stunning must-have accessory. I cannot see any marks or holes. PATTERNED LONG MOD SCARF GREY FUNK GEOMETRIC PRINT 60'S ASCOT 8.5" X 52"
Chest: 52" Length: 8.5". Fantastic retro print. It is in very good HARDLY used condition. 78 cm x 78 cm. It is in pristine condition and could easilybe unworn. It would therefore make a lovely gift. Large Vintage Square Silk Geometric Mosaic Multi coloured 1970s/80s. A beautiful silk scarf with multicoloured mosaic design on a dark red background. Hard to see. Outfit not included in this sale. Scarf Only. VINTAGE RETRO GEOMETRIC SQUARE WRAP SCARF SCARVE WIDTH 30x30"
Green And White Geometric Pattern Ladies Vintage 60s Mod Scarf.